Redmi Note 6 Pro Specs, Camera Details and Price leaked! 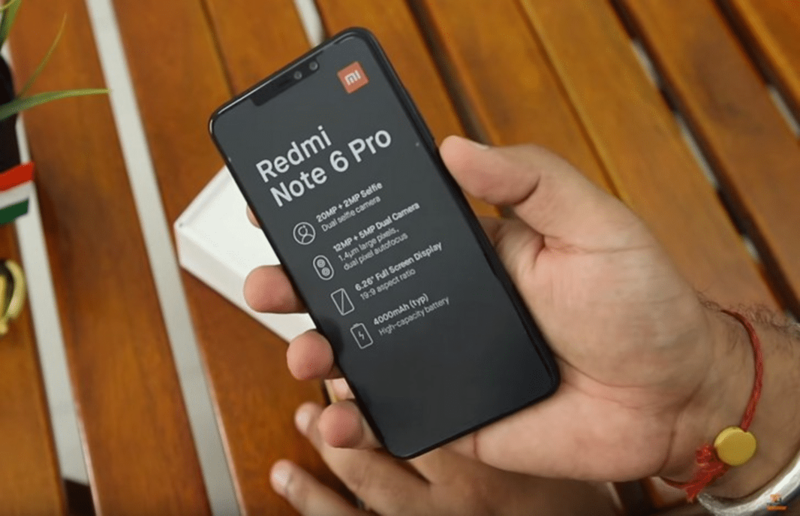 Xiaomi’s Redmi Note 6 Pro is a highly anticipated smartphone in India which will be a successor to the currently popular Note 5 Pro. The rumors have been around for a while about the configurations and expected price range. But recently, some valid sources have revealed the actual specifications of the upcoming Redmi Note 6 Pro. Redmi Note 5 Pro was released earlier this year, in February, in India and since then the wait for the next version has increased a lot. The recent leaks have confirmed that the soon to be announced, Note 6 Pro will be possessing a Full HD+ 6.2inch display, (with a resolution of 1080x2160p) and an aspect ratio of 19:9. It will be again a dual-SIM (Nano) phone with an option of expanding the storage. Initially, the inbuilt capacity will be 64GB, coupled with 4GB of RAM. Although, there are reports of another variant, having 3GB of RAM and 32GB of storage. But the important aspect will be on the performance front, and according to strong leaks, Note 6 Pro will also sport the same Qualcomm Snapdragon 636 chipset, according to the phone’s listing on AliExpress, a retailer. Well, if this is actually true, then Xiaomi needs to rethink on this. They keep inserting the same chipset continuously, even in the successive models in a series. The Android platform will come with the MIUI 9 out-of-the-box. So, no MIUI 10 yet. There will be the same dual-rear camera setup of 12MP+5MP (no significant improvement from the last model), but the interesting addition is on the front of the phone. For selfies, there will be a dual-front camera setup too! It will be a 20MP+2MP combination for taking depth-of-field shots and even better portraits now. For connectivity, the phone will support 4G (VoLTE) and will have Bluetooth, WiFi, Micro-USB port for charging and transferring media. Xiaomi should add a USB Type-C port now, as it enables faster speed of transferring files. The battery will be huge, at 4000mAh, like the regular Redmi series phones. All the above-mentioned details are still not confirmed officially by Xiaomi itself, so there are hopes for some improvements in the leaked information. Going by the rumors regarding the ‘global’ model of Redmi Note 6 Pro’s leaks, the phone may be priced from $194 to $219 in overseas markets. That translates in India to a range of Rs.14,000 to Rs.15,900. According to AliExpress, the retailer, it has been actually shipping the Note6 Pro in the US and UK, but not in India. But the phone will be cheaper in India, whenever it arrives, later (maybe in the next month). Because generally, all the Xiaomi phones are priced in the budget range for the Indian consumers. And going by this retailer’s details the phone will be coming in four color options, namely blue, black, rose gold and red. Meanwhile, if you haven’t bought any of the Redmi phones yet, then you can go for the best model, in India at the moment, which is undoubtedly the Note 5 Pro, that has really amazing features and camera capabilities. And it comes with a budget price also that won’t cost you high.